We are live and FREE on the Apple App Store! Download now! 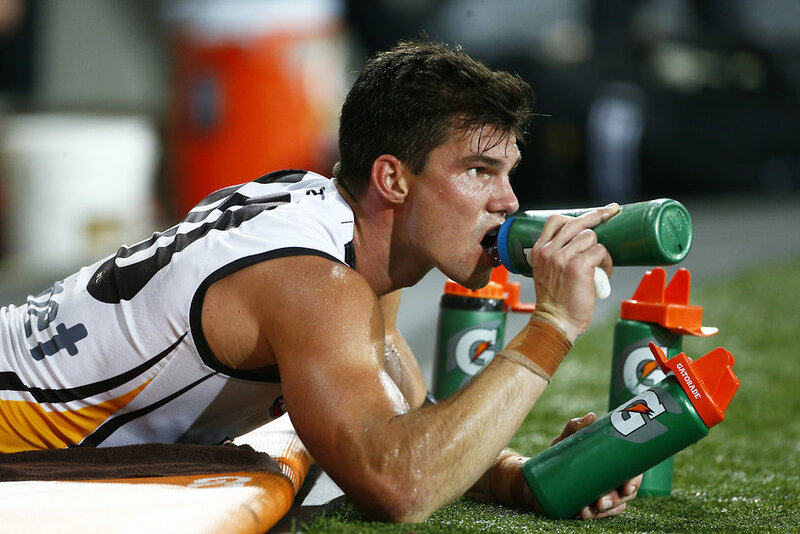 What’s the best way to fuel and prepare your body for a game of footy? To make it easier, if you get our app and punch in your details, we personalise this all to you! But heres some info to help you along…. The best way is to start 24 hours before the game. The day before, you need to increase your carbs (pasta, bread, rice) and make sure you are well hydrated. Our app has meal examples for the day before the game. You should top up your energy levels by eating or drinking small amounts of carbohydrates throughout the match. Half time and quarter time provides a great opportunity to re-fuel. Some players choose to have a snack like a banana or energy bar at the longer break; however, many players prefer not to eat solid foods during the game due to the intensity of the game and for gut comfort. In these cases, sports drinks and energy gels can be helpful for topping up energy levels. During the game, fluid is also important. You can use the breaks to drink fluid, but you can also access fluids during the game via the trainers on field. Water is an ideal, however, as glucose levels (a sugar that powers your muscles) can run low during the course of a game, Gatorade can provide an extra source of carbohydrate as a fuel. Please remember the need for sports drinks will depend on individual needs and preferences. Your meals should contain carbohydrate, some protein (for muscle repair and development) and fluids and electrolytes (salts) to replace sweat losses. Your recovery meal or snack should be consumed soon after training or matches to give you the most benefit! After matches, some players often don’t feel like eating very much due to the how tough the game is on your body, but eating easy to eat carbs and protein containing foods after a match is important! Fluids with carbohydrate and protein can be a great option in the early stages after a game when your appetite is poor. Share this with your mates so they can be ready to play games and help the team win with them performing at their best!